A garden at nearly 7,000 feet above sea level? A four month plant growing season? Thick snow and ice the rest of the year. Welcome to one of the highest botanical gardens in the world, the Schynige Platte Alpine Garden in Switzerland’s Bernese Oberland not far from Interlaken and set in some of the most impressive landscape to be found anywhere in the world. 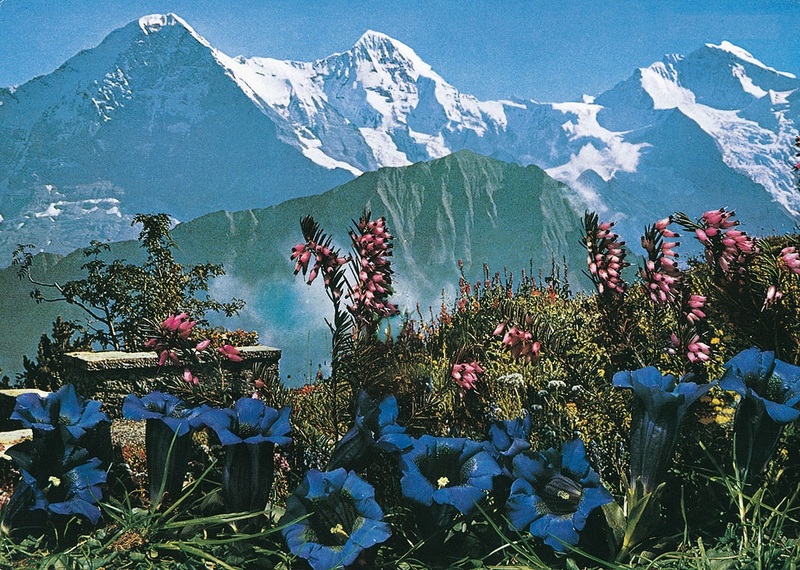 Framed by a trio of famous Alpine peaks – the Jungfrau, Monch and Eiger, snow and ice-covered monoliths reaching up to nearly 14,000 feet – the Garden was founded in 1927 and displays no less than six hundred labelled plants. What’s more, entrance is free except that it’s quite expensive to get up to it unless you walk from the village of Wilderswil in the valley below, a climb of about 5,000 feet. By the time you have done that, you will be too exhausted to be looking at flowers! The more usual way of reaching this fabulous garden is to get the historic cog-wheel train from Wilderswil (60 Swiss francs/$62 return which includes two children free per adult), an hour’s trip up through forests and alpine meadows that’s hard to beat for scenic beauty. It first negotiated these steep slopes in 1893 and runs every summer. Once you’re into the garden just off the rail platform at the Schynige Platte Bergstation, your biggest problem is where to look first. Surrounded by every colour imaginable dripping over patches of rock and gravel, it’s best to follow the well marked, narrow gravel paths from one re-creation of a botanical habitat to another. Then you can get a picture of the alpine plants typical of snowbeds; plants of calcareous rocks like the little, delicately white-flowered Dangling Cinqufoil; matgrass meadow plants; dwarf shrub heaths dominated by black-berried Crowberry and its like; plants such as the tall, purple-blue flowered Alpine Sow Thistle found in wet Green Alder scrub and many more. But it’s hard not to get attracted to the most colourful. The little buttercup yellow Orange Poppies lighting up the rock crevices and gravel they thrive in. The foot-high clumps of fragrant, white St Bernard’s Lily like miniature trumpets springing from grey-green grass-like leaves. Or the elegant, tall and intensely blue spikes of Alpine Larkspur. It’s easy to overlook some tiny gems by getting too entranced with the more colourful alpine plants here. The delicate and tiny fronds of the Moonwort fern for example, no more than three or so inches tall, a single frond with pairs of fan-shaped leaflets accompanying a second stem bearing grape-like clusters of spore bodies. It peeps out among a dense cover of grasses, not an obvious plant but a beauty nevertheless. June – as the last snows melt – is the best time for blue and purple Soldanellas and for Crocuses followed by yellow-centred, white-petalled Pasque Flowers. July is maybe the peak (depending on season) with an array of grey-white Edelweiss, Alpenrose, Alpine Poppies and Alpine Asters bringing a rainbow of colours. August is no slouch either; tall pink-purple Martagon Lilies compete for height with clumps of Yellow Gentians. And September still has plenty to impress you with too. But there’s no need to stay inside this famous botanic garden to appreciate the alpine flora of Schynige Platte. Many of the meadows, the slopes, rock outcrops and screes all around are simply burgeoning with a cornucopia of wild plants including very many that were labelled within the garden. The whole place is one of the finest in Western Europe in which to search for alpines. Add into the mix the stunning mountain views, birds including noisy, yellow-beaked Alpine Choughs, Water Pipits engaged in their parachute flight song displays and tiny green Citril Finches flitting from shrub to shrub. And – with luck – you might spot a Marmot, even a whole colony of these attractive large rodents that can burrow into soil so hard a pickaxe would find it difficult to penetrate and which have a loud, piercing whistle-like scream whenever predators are nearby.